Our Father, who Art in Heaven. Hallowed be thy Name! Thy Kingdom Come, Thy Will be done, on earth as it is in HEAVEN. Lead us NOT into Temptation, but DELIVER us from the evil one! For Yours is the Kingdom, the Power, and the Glory FOREVER!!! Amen! There are several scriptures in God’s Word that we can use to help us overcome temptation. Stand on God’s Word, in Faith, and Jesus WILL show up and help! If you belong to Jesus Christ, then you have His Holy Spirit dwelling inside of you. This is GOOD NEWS because Jesus came to set the Captive FREE! You are NO LONGER a SLAVE TO SIN! Wrong thinking will lead to wrong actions. Sin usually starts IN THE MIND. We can take our thoughts captive, not allowing ourselves to dwell on impure thoughts. If an impure or wrong thought comes to mind, simply say to yourself “I’m taking this thought captive to the obedience of Christ”…and then think about something else. Matthew 5: 27 “You have heard that it was said, ‘You shall not commit adultery’;28 but I say to you that everyone who looks at a woman with lust for her has already committed adultery with her in his heart. 2 Corinthians 10:5: We are destroying speculations and every lofty thing raised up against the knowledge of God, and we are taking every thought captive to the obedience of Christ, 6 and we are ready to punish all disobedience, whenever your obedience is complete. James 1:14: But each one is tempted when he is carried away and enticed by his own lust. 15 Then when lust has conceived, it gives birth to sin; and when sin is accomplished, it brings forth death. Ask Jesus to make you aware of the people in your life who are “tools of the blacksmith”. These are people who want to put temptations in your path or drag you into some type of sin. My mama used to say “When you play in the dirt, expect a little to rub off on you!” Once the Holy Spirit identifies these “tools of the blacksmith”…….CUT THEM OUT of your life like a CANCER! My personal favorite….With every temptation, God provides a way out, a “BACK DOOR”. When presented with a temptation, look for that way out, that back door. In-fact, PRAY and ask JESUS to SHOW you the BACK DOOR, the EXIT! STAY AWAY FROM SIN’S “DOOR”…. Proverbs 5 provides VERY SAGE advice in our quest to avoid sin! What is easier to avoid, a door or a “beautiful adulteress?” It’s kind of like being an alcoholic and staying away from the BARS! If you go into the DOOR, you will have a much harder time RESISTING the sin. It’s best to PRAY and ask God to STRENGTHEN YOU so that you can stay away from the “DOOR”!!! Galatians 5:16: But I say, walk by the Spirit, and you will not carry out the desire of the flesh. 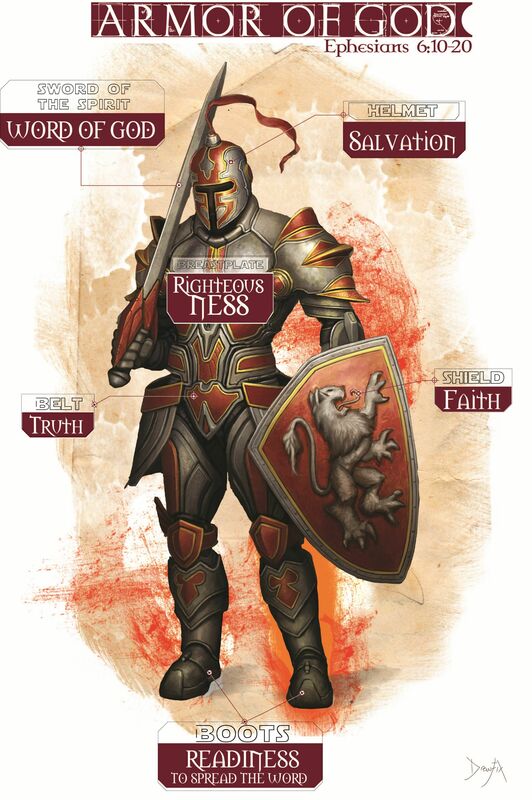 In order to be READY for the BATTLE that we face every day, we need to put on the FULL ARMOR OF GOD (Ephesians 6:10-17). Going into Battle without armor is akin to SUICIDE. There are 6 pieces of the Armor of God that need to be applied every morning. The sword of the Spirit is our offensive Weapon. This is what we wield when we rebuke demons in Jesus’ Name. Jesus IS the Word of God made flesh, and His Spirit LIVES inside of each and every believer. LISTEN to the Holy Spirit, and READ the written word of God to get the TRUTH! Faith in Jesus Christ, in His Word, is our shield, and will DEFLECT the fiery darts of the enemy! The Belt of Truth shows us that God REMAINS with us, He hasn’t left us because we messed up, He still LOVES us, and HE will help us! Helm of Salvation comes with KNOWING your SAVIOR JESUS, who has SAVED YOU from eternal death through HIS SHED blood at the CROSS! We put on the Breastplate of Righteousness, right up next to our hearts, when we give our hearts to JESUS and desire to please ONLY HIM! This is the Word of God written on our HEARTS. Let’s not forget the sandals of peace. This is the Peace of the Lord that allows us to be calm in any situation. Beautiful are the FEET that spread the Good news of the Gospel!